SEFA artist Carole Eisner was featured in Sunday’s issue of the New York Post. Eisner, who is best known for her monumental outdoor sculptures, was recently mentioned alongside her 2005 work “Valentine,” which appeared in Mark Kaplan’s article, “Outdoor Sculptures are the Ultimate Luxury for NY Art Collectors,” on August 5, 2018. 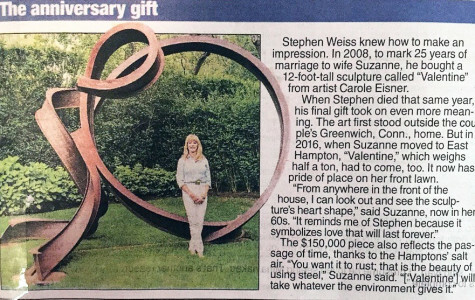 “Valentine” was purchased by Stephen and Suzanne Weiss in 2008 to commemorate their 25th wedding anniversary. To read the article in full, please click here. 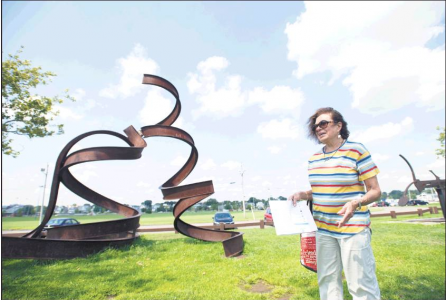 Carole Eisner also appeared in Norwalk Connecticut’s newspaper The Hour this past Sunday where she was photographed alongside her work, “Dancer.” Eisner, who lives and works between New York City and Connecticut, hosted a free talk in the town’s Veteran’s Memorial Park, where the sculpture is currently on view. To see more, please click here. “Dancer” was most recently exhibited in Prospect Park in Brooklyn through the Prospect Park Alliance’s “Art in the Park” program. To read about that show, visit the link here.